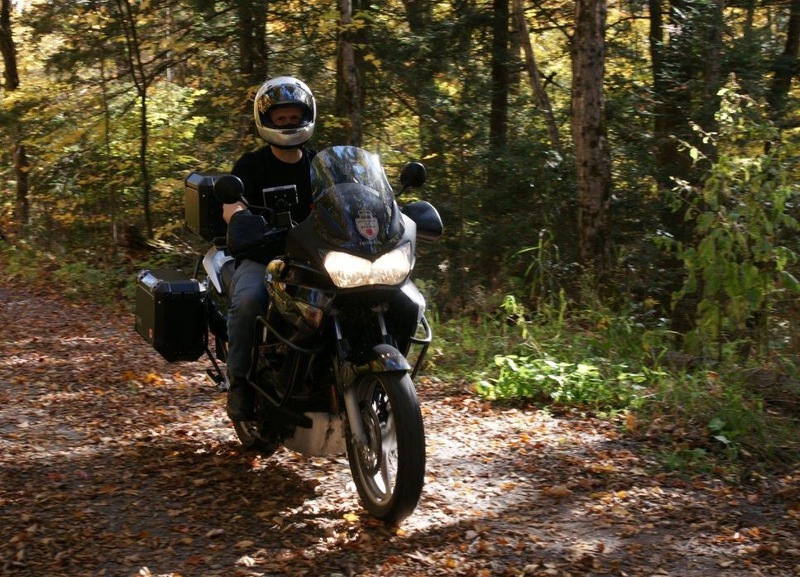 It all began early spring when I decided that after some 25 years of not riding a motorcycle that something important to me was missing in my life. Simultaneously with that decision, I had already decided (and accomplished) a huge change in my eating habits that resulted in a total weight loss of 65 pounds. This also resulted in dramatically changing my blood test numbers whereby I was almost diabetic with a Blood Sugar at 6.9 after fasting and I now am at 5.2. All the other numbers also fell in line and my doctor (who is a cutie) told me that I had just added 25-Healthy Years to my life so I should maintain this new way of eating. Therefore, this news just supported my idea of getting a motorcycle to help me enjoy these last 25-healthy years. And so began my quest to find the perfect bike. My stating point was my brother-law who often would show up on his Honda Varadero, which is an adventure bike. My brother-in-law (like myself) never goes half way into something. Notice in the picture that his bike is fully loaded with the top of the line accessories including his armor wear and Arai helmet. My sister also rides a bike and so does a neighbor friend of mine. All of them are BIG bikes. I mean over 1000 CC of power. In the seventies, I rode a Yamaha 125 and a Honda CB 350. The largest bike I ever rode was a Kawasaki 400. So I was a bit confused to what type of bike I wanted and in which direction I should go. I did not mention earlier that in addition to changing my diet, I also had a problem with two muscles in my feet. After a year of special exercises, shoe inserts and so on, they feel quite good now. However, last year I traded in my standard Pontiac Vibe for automatic Honda Civic Leather with navigation. Not using the clutch seemed too dramatically speed up my feet’s healing process. With that in mind, I was a bit concerned about changing gears with my left foot while breaking with my right. Therefore, I started to look at Scooters. Keeping in line with my sister and brother-in-law, I started to look at BIG scooters such as the Suzuki Bergman, Honda Silverwing and the Yamaha T-Max. They ware bottom heavy and therefore handle as a dream compared to some bikes such as my brother-in-laws that is not bottom heavy. This list just continued to grow on the pros side and there were no further entries on the cons side. Therefore, I began visiting dealers and surfing kijiji and auto-traders in search for my perfect bike. In fact, during my visit to the local Honda Dealer, he told me that he might have the perfect bike for me in a week or two. He explained how he had sold a Goldwing last year to a man who wanted to teach his wife how to ride so that they could get another bike and ride together. As it turned out, she did not like riding but preferred being a passenger. Therefore, he was looking at a new cruiser. The Silverwing had 900 kilometers only and was still under the manufacturer’s warranty. He said the price would be $ 5,000.00 to $ 6,000.00, depending on the deal he makes. This was right in line with my price expectations. The problem was that I had a small itch that just would not go away. It all started late one night when I came across the Vespa USA site on the internet. I watched their videos. I discounted this as an option because of the size and well,; because it was a Vespa of all things. However, the itch just would not subside. Every night I would return to a new YouTube video of a Vespa. Why I did? I have no idea. At this point, the only certainty is that I would buy a scooter….